For those wanting to focus on nourishing wholesome meals packed full of nutrients, these are the spots for you. By Chloe, Covent Garden & Various Locations – Originating in NYC, this plant-based restaurant has everything from wholesome salad bowls through to delicious baked goods. It has delicious options whether you’re feeling wholesome or indulgent. Kalifornia Kitchen, Tottenham Court Road – This bright pink eatery is located just off Tottenham Court Road and has a focus on sustainable, healthy eats which are packed with flavour. I love their jackfruit tacos and Sri Lankan curry! Redemption, Shoreditch & Notting Hill – A 100% vegan restaurant which serves a mean brunch, lunch or dinner. I love their buddha bowls. Not to mention their non-alcoholic cocktails. 222 Veggie Vegan, West Kensington – A wholesome vegan restaurant serving up fresh meals balanced out with vegan desserts. Farmacy, Notting Hill – A healthy vegan-friendly restaurant serving up juices, salads, bowls and smoothies. I love their nachos with guacamole and black beans! Wild Food Cafe, Covent Garden – A beautiful cafe in Neal’s Yard serving up vegan and raw dishes, their banana bread is divine. Wulf & Lamb, Sloane Square – One of my regular haunts. An amazing brunch and dinner spot. The scrambled ackee for breakfast isn’t to be missed, and neither is their Mac N cheese or their carrot cake. I am addicted. 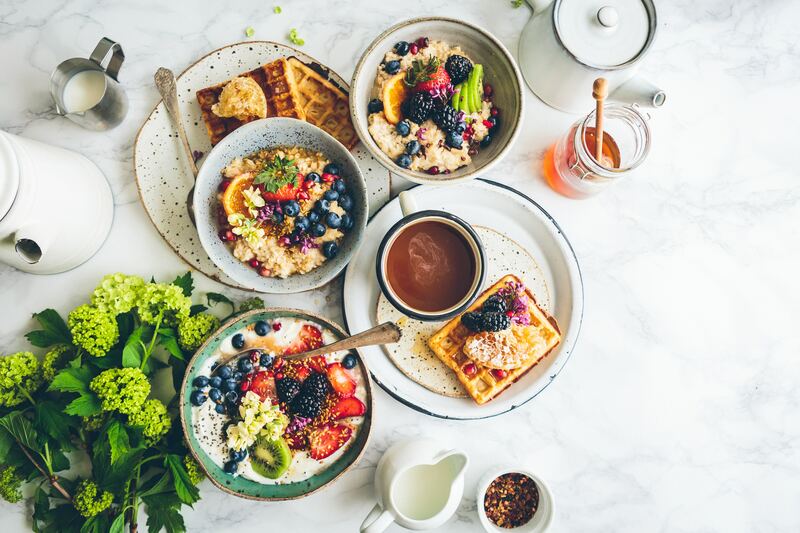 Juicebaby, Chelsea – Located on Kings road, this cafe serves up delicious vegan salads and desserts as well as a wide array of cold pressed juices. Itadaki Zen, Kings Cross – Wholesome organic Japanese vegan dishes. Even better, the owners of the restaurant host workshops on sustainable food. Nama Foods, Notting Hill – Raw vegan dishes. Delicious but be warned that they serve small plates which come with a hefty pricetag. Leles, Hackney – A relaxed brunch spot serving up healthy spreads as well as more indulgent bakes. Beautifully presented, perfect for instagram! 90 Degree Melt, Mile End – Epic American vegan and vegetarian food. Ranging from the healthy to the extremely indulgent, a place to please everyone! Their brunch is one of my favourites. Tibits, London Bridge & Soho – A Swiss buffet restaurant who serve up a huge variety of veggie and vegan dishes. Mildreds, Soho & Camden – A vegetarian and vegan restaurant with the most ridiculously delicious food. Its extremely popular and they don’t take bookings so get there early. Jane Tira Thai, Soho – Authentic Thai food with a huge vegan menu, including vegan wine! Ethos Foods, Soho – A buffet style restaurant which a huge selection of vegetarian and vegan food located right behind Oxford Street. Cook Daily, Shoreditch & Croydon – Epic vegan food. “Chicken” and mushroom pie, full english breakfasts, curries and more. A mix of wholesome and more indulgent options! The Calabash of Culture, Lewisham – A vegan cafe serving some epic filling and wholesome dishes in a unique setting. Black Cat Cafe, Hackney – A bohemian, volunteer run cafe serving up delicious vegan food. Fed by Water, Dalston – Italian gourmet vegan food. Pizza, pasta and all that good stuff! Vanilla Black, Chancery Lane – A la Carte vegetarian and vegan dining. For when you’re feeling fancy. The Gate, Marylebone, Hammersmith & Islington – A classic vegetarian and vegan restaurant serving up high quality seasonal dishes. Manna, Primrose Hill – A 100% vegan restaurant with a varied menu from sushi to nachos! Hakkasan, Mayfair – This is one of my favourite high end restaurants and they now have awesome vegan options on the menu. Be sure to try their “chicken”! Matsya, Mayfair – High end indian food which is super vegan and veggie friendly. ROKA, Mayfair – These guys have just launched a vegan tasting menu which is absolutely phenomenal! 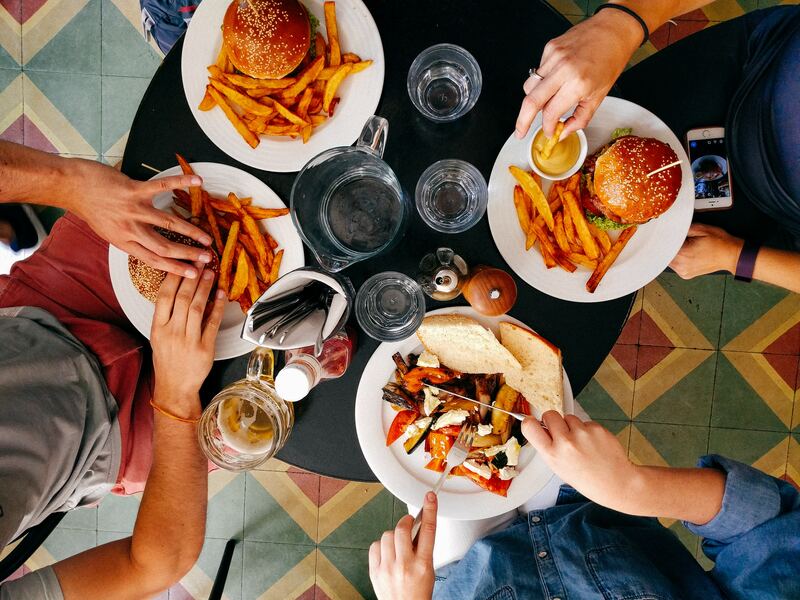 Vegan food doesn’t have to be boring, give these cafes, restaurants and bakeries a try. 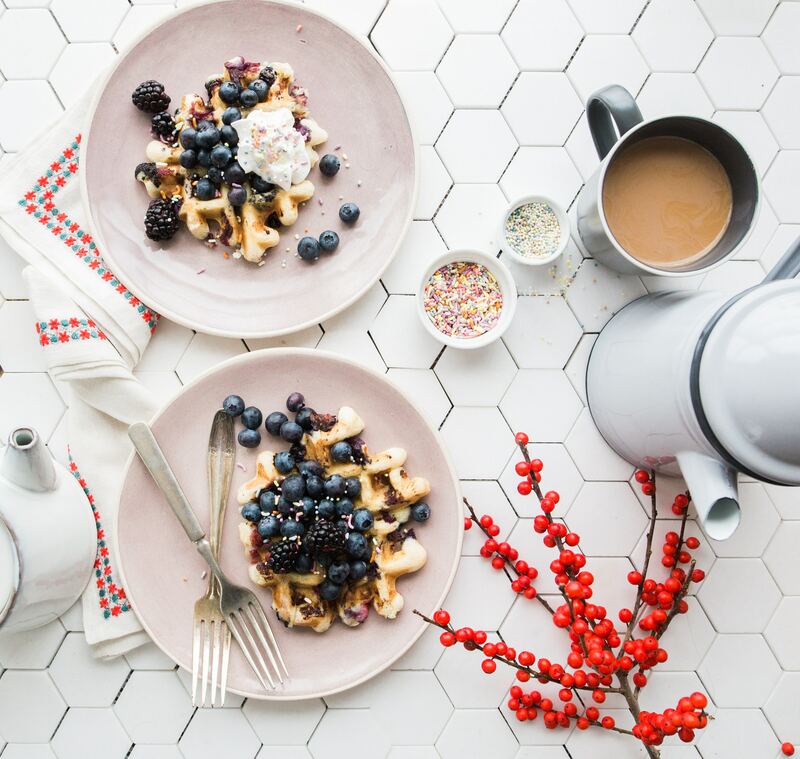 This Is A Coffee Shop, Shoreditch – This beautiful breakfast and brunch spot serves colourful superfood lattes, vegan cakes, delicious brunch all with a side of cat cuddles. The Fence, Farringdon – Mediterranean inspired meals with an epic vegan selection. Think seitan satay, vegan burgers and chickpea fritters! Yorica, Soho – The ultimate vegan dessert cafe. 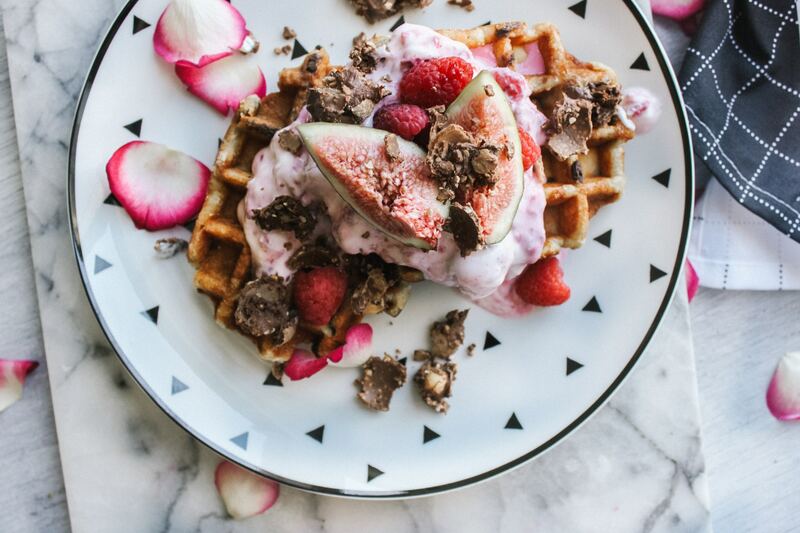 Waffles stuffed with ice cream, froyo and more. It is heaven. Haunt, Stoke Newington – Vegan burgers and pizzas by night, and epic brunch spreads by day. Temple of Seitan, Hackney – Famous vegan junk food. Epic burgers, fried chicken and Mac’n’cheese. Picky Wops, Fulham – The best vegan pizza in town, try the vegan cheese stuffed crust! The Coach & Horses, Leicester Square – Londons first vegetarian and vegan pub. Expect twists on classics such as vegan fish and chips. Cookies & Scream, Holloway – An entirely vegan bakery which will blow your mind. Cakes, bakes and ice cream sandwiches are on the menu. Cupcakes & Shhht, Elephant and Castle – Artisan vegan coffee shop with the most indulgent yet beautifully presented cakes, bakes, cookies and treats. Oh and not mentioning their “freak shakes” which can’t be missed. Rubys of London, Greenwich Market – Award winning vegan bakery who are best known for their doughnuts and cupcakes. And their cupcakes topped with doughnuts! Ms Cupcake, Brixton – A vegan cupcake shop which also serves up a mean millionaire shortbread and some epic shakes too! Dough Society, Hackney – Named the best vegan doughnuts in London by multiple journalists – you don’t want to miss them. Mooshies, Brick Lane – Vegan comfort food at its best; burgers, fries, cheeze sticks, brownies and milkshakes galore! Vurger, Pop-Ups & Markets – The ultimate vegan burger stand. Don’t miss it! Club Mexicana, Pop Ups & Markets – The best vegan tacos I have ever tried. The tofu “fish fingers” are mind blowing. Want to try vegan bakes, cakes, burgers, pizzas, salads and everything in between? Check out Broadway Vegan Market – it happens every Saturday 10-4pm. Pop down to Vegan Nights food festival on Brick Lane the first Thursday of every month – I have been 4 months in a row! New vegan restaurants and cafes are popping up on an almost weekly basis, so I will continue to update this guide as I discover more plant based eateries!